Households and businesses having some sort of filtration system for water is becoming more and more common as the concern about fresh drinking water grows. 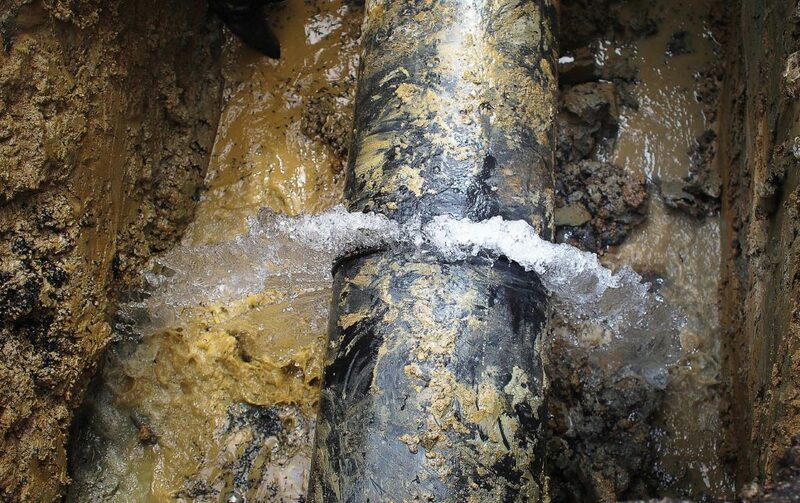 With most water pipes having been installed around the ’30s and ’40s, some even earlier, the impact aging water infrastructure creates is becoming more apparent. It may be out of sight, but it isn’t out of municipalities’ minds, with many taking initiative on the matter. Funding is the primary challenge cities face when it comes to healing their water infrastructure. There are various grants, loans and programs available, depending on the state and location of the city. For Poughkeepsie, N.Y., the state created the Clean Water Infrastructure Act in 2017 to assist municipalities with replacements. Poughkeepsie received a $544,754 grant in March, which will go toward replacing lead service lines. While it wasn’t something the city intentionally sought out, it quickly took advantage of the opportunity once realizing it was eligible. “We’re in the process of designing and rolling out a program that’s going to start working on that important replacement. When the opportunity presented itself, we were quick to jump on it,” stated Poughkeepsie City Administrator Marc Nelson. “We have a lot of work to do on the sewer side and are working with our grant writers for some funding so we can get in there with a high-definition camera. 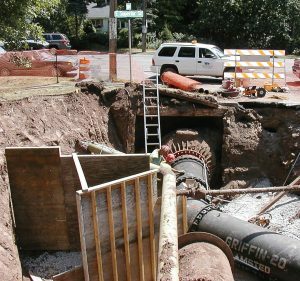 The city has completed a variety of water infrastructure improvements, such as upgrading the water power plant and a reservoir replacement project, all of which were funded through the Environmental Facility Corporation and state aid grants. There are also several environmental groups, some of which are made of local municipalities, that have partnered with one another to address various water-based projects, including protecting water at the source. 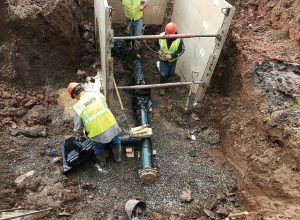 Several cities across Minnesota are addressing the replacement of leaking pipes, but Duluth is doing something a bit different — rather than borrowing money, it is raising the rates by 4.7 percent over six years. Multiple public meetings were held, giving Eric Shaffer, Duluth’s chief engineer of utilities, the opportunity to speak with various groups, educating them about the problem and the reasoning behind the rates rising. As to be expected, some understood and supported the idea while others didn’t. “We’re trying our hardest to pay cash for everything we do, though we do have to borrow money every so often,” said Shaffer. “Historically, we’ve learned from our sanitary sewer fund that if you just continue borrowing money, eventually you’ll pay more than the actual work being done. So we’re trying to build up cash revenues and rates. Duluth faces 280 repairs a year on average, costing the city quite a bit when it comes to crews working overtime as well as project expenses. In retaliation, the crews have been targeting the worst water mains as their first step in battle. 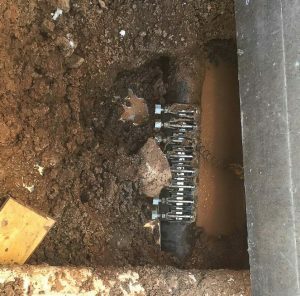 Fixing those mains will cut down on overall expenses. Coordinating with other departments and organizations is another challenge both cities have faced. Th ere is no greater frustration than having to tear up a newly paved road in order to fi x a leak or replace pipes. Roads within city limits owned by the county or the Department of Transportation may have road replacements occur without any prior communication, posing an issue for water utilities. 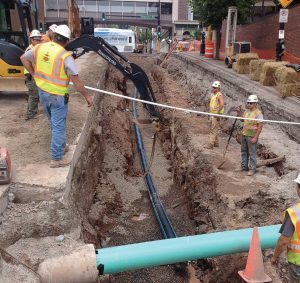 By planning ahead and looking at road projects, Duluth and other cities can partner with another funding agency to save money, making those the least expensive water mains. Joint projects with other entities save the city from having to rip up and restore the pavement on its own. Making the first move is the biggest step as it will propel the city into an ongoing spiral for constant projects. In Nelson’s words, there is no rest for the weary. It’s easy to become overwhelmed with the messy maze of old pipes that go for miles and miles, but it is important to take a step back to observe the situation objectively before prioritizing. Informing and educating the public over the importance of replacing aging water infrastructure is imperative. While drinking tap water a couple decades ago didn’t impact a person’s health, that isn’t the case today. Clean water goes beyond basic public health to environment and economic vitality as well. It can’t be helped when things get old and need to be replaced. Understanding the estimated life expectancy of pipes and installing materials that will last 100 years, while fitting well with the area, is something that will help cities stay ahead and create progress for the future. Waiting only hurts the city, eventually making the situation costlier as time passes.